Hundreds of bereaved families sign petition supporting Defense Minister's opposition to joint Israeli-Arab memorial day ceremony. Hundreds of bereaved families have signed a petition urging Defense Minister Avigdor Liberman not to back down from his decision to bar 110 Gazans from entering Israel in order to attend an alternative memorial day ceremony. 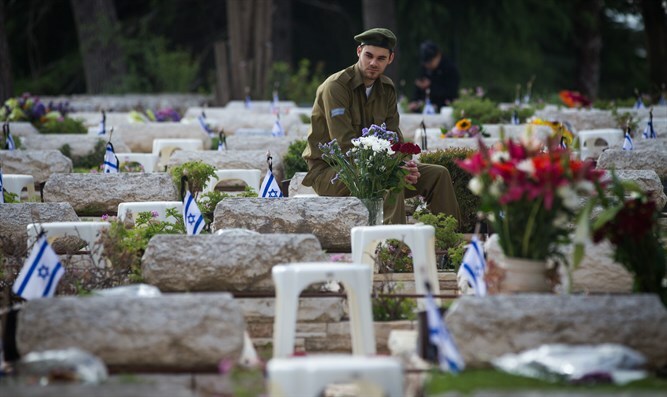 "We express our strong opposition to the attempt to harm the sanctity of the State Memorial Day for the Fallen of Israel's Systems and the Victims of Hostile Acts, and in a provocative and offensive move to bring into the territory of families of terrorists, who are really just lowly murderers and their accomplices," wrote the families. The families added that the joint ceremony "presented a false narrative of equality between the holy fallen soldiers and terror victims that fell for the rebirth of our country and these lowly people who attempted to kill women and children." The petition comes as the Supreme Court is set to deliberate the legality of Defense Minister Avigdor Liberman's decision to ban entry of 110 PA Arabs invited to participate in a joint Israeli-Palestinian memorial ceremony. The ceremony is expected to take place in Tel Aviv on the eve of Memorial Day for fallen IDF soldiers and victims of hostilities. Liberman had said that the event was insensitive towards the bereaved families and was in "bad taste". "I won't aid and abet desecration of Memorial Day. It's not a memorial ceremony, but a demonstration of bad taste and insensitivity that harms the bereaved families who are dear to us," said Liberman. Roni Kleinold, one of the initiators of the petition, who lost his brother Moshe Kleinwald and his brother-in-law Moshe Tal, said that he hoped that the Supreme Court would dismiss the petition. "The organizers' cynicism, which gives a place of honor to slain murderers, Is a painful blow to the hearts of many members of the bereaved family and to the dignity of the fallen. I expect the court to reject outright this hallucinatory petition, which is intended to make political capital for the blood of the many fallen in Israel's wars," said Kleinold.